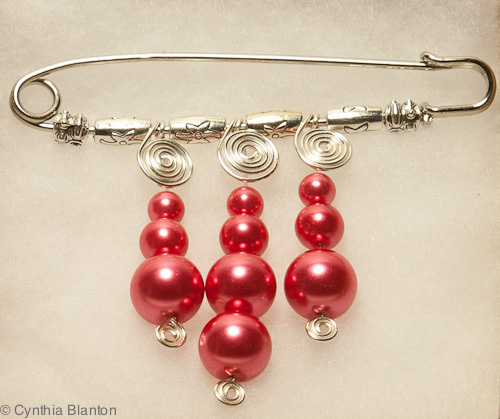 This is a "Bend it Yourself" safety pin with silver zinc beads, silver-plated wire swirls and red glass beads. This pin was made from black, white and gray layers of clay, imprinted with different texture sheets, and then the high spots shaved off. Sanded and buffed so it is completely smooth. Mica shift with gold clay. Imprinted with Helen Breil's texture sheet and then high spots shaved off. Sanded and buffed so it is completely smooth. It really looks 3-dimensional in real life. From the cane I made in Carol Simmon's Kaleidoscope Cane class. 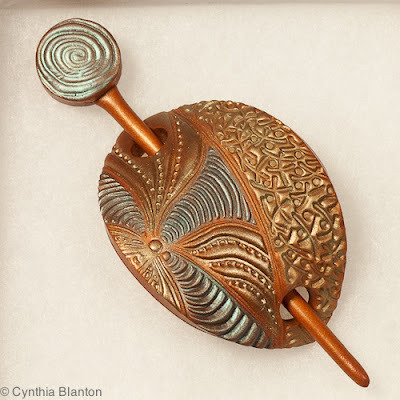 Design made in raw clay using various implements. Antiqued after baking. 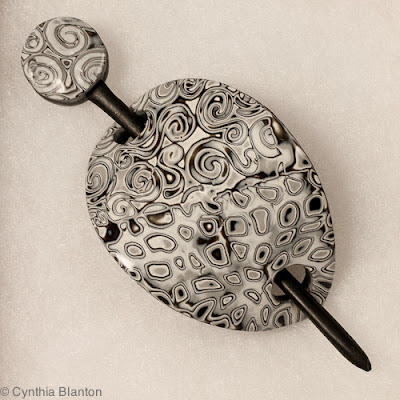 Imprinted with Helen Breil's texture sheet and then highlighted with Perfect Pearls while raw. Wondering if I need to seal it. Made using Wendy Orlowski's Feather Boa texture sheet. 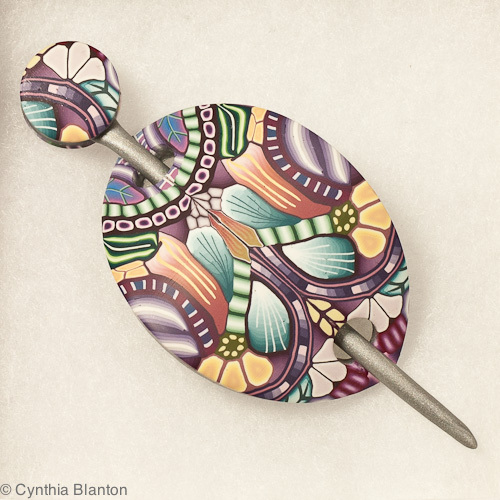 Lovely combination of techniques on this Shawl Pin page! Pefect Pearls bakes in...Pearlex needs to be sealed...so you should be fine!!! Gorgeous. I love the mica shift! What wonderful creations you have made! Are you planning to do a tutorial in the future? I would be very interested in learning how you make the hair barrettes. Thanks, Kat. No plans to do a tutorial at least for now. 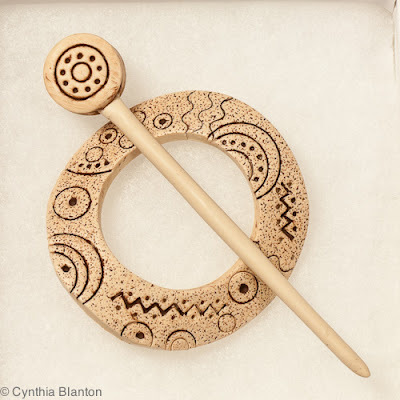 A friend and I collaborated on how to do the sticks and until she is willing to share the secret, I can't reveal it. Thanks for letting me know and if you two ever do decide to make a tut let me know please as I plan to be first in line! 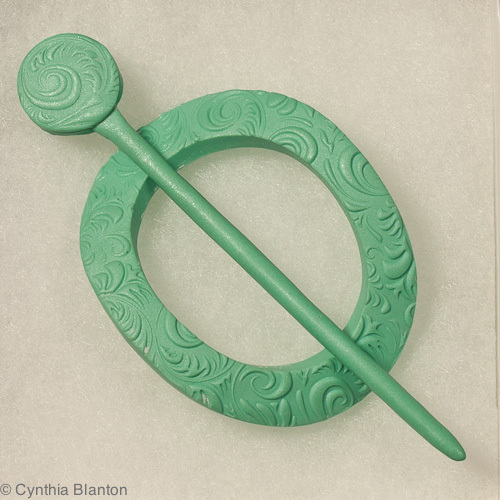 I use this kind of barrette as have below the hip hair. 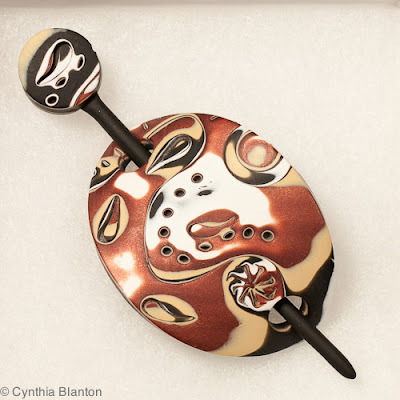 What a great way to show off different polymer clay techniques - I hope they sell well for you. 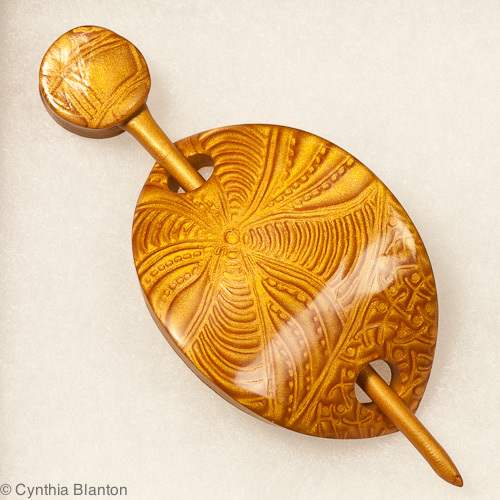 These would be wonderful as barrettes, too. Great! These are brilliant, I love the raw clay one.